This section highlights the birds of The Galapagos Islands. The Galapagos is truly a birder's paradise. While the number of species is not as high as on the continents, the ability to get very close to the birds and to see their behaviors in their natural settings is what makes the Galapagos so special. We also like the fact that there's a pretty good chance of sighting almost all of the major species if you have enough time, travel to the highlands of Santa Cruz and San Cristóbal, and have the means to get to many of the islands. The only bird which we know we didn't see (other than some Darwin Finches, which are very difficult to tell apart) was the flightless cormorant. It lives mainly on the rocky coastline of Isabela Island, but not along the southern coast where we were allowed to anchor our boat. We used several reference books while we were in the Galapagos. Seabirds: An Identification Guide by Peter Harrison is a superb guide to seabirds of the world that should be in every serious bird-watchers library. Wildlife of the Galapagos by Fitter, Fitter & Hosking, is a more general wildlife identification book especially useful for its inclusion not only of birds, but insects, marine and land mammals and reptiles. According to the World Wildlife Fund, 80 percent of the land birds are endemic, meaning they occur only here. As we studied the wildlife guide to the Galapagos we were surprised to see that we were familiar with more than half the birds, though not of course, the Galapagos sub-species. What follows is a sampling of the birds we saw during our month in the islands. For more information on our travels in the islands go to Santa Cruz, San Cristóbal, Isabela or the Galapagos Tour Destinations pages or the Galapagos Newsletter. Links on those pages will bring you back here. 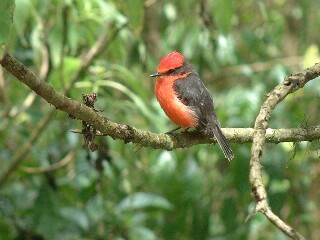 The male Vermillion Flycatcher has a brilliant red crown and underpants, set off by black upper parts, tail and eye stripe. The female is a dull yellow, as are the young. Some ornithologists say this is the same species as the vermillion flycatchers of the southwestern US, all the way to Argentina. 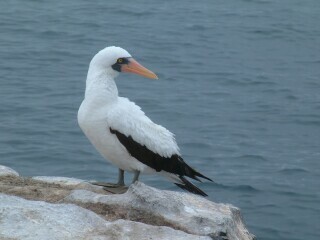 Others say these highland birds of Santa Cruz and San Cristóbal Islands comprise two other species. Whatever, they are stunning to see whether perched or swooping and diving for insects. 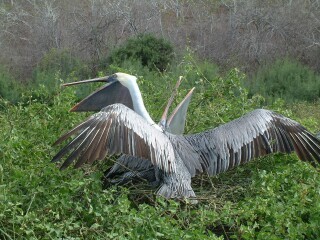 The Galapagos Brown Pelicans are a subspecies of the very familiar brown pelican of the West Indies. The beauty of seeing them in the Galapagos is that you can approach within a few feet even during their courtship displays or while incubating eggs. 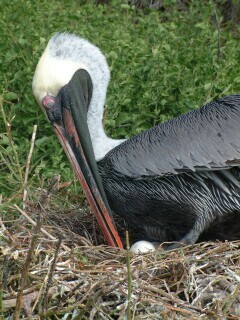 Both males and females sit on the 2 or 3 eggs that are laid in their large seaside nests. Antarctica? No, the Equator! The Galapagos Penguin is the third smallest species of penguin in the world, and thrives in the cold waters of Equatorial Galapagos. They have a characteristic white breast, but when approached they often turn away. Not that they're shy -- it's just great camouflage against the black lava rock. About 1,000 to 1,500 breeding pairs live in the islands. The female lays a clutch of two eggs, of which usually only one survives. These are the northern-most penguins in the world. Related to the gannets of North America, the Boobies (here, the Blue-footed Boobie) are large diving seabirds, with dagger-like bills. 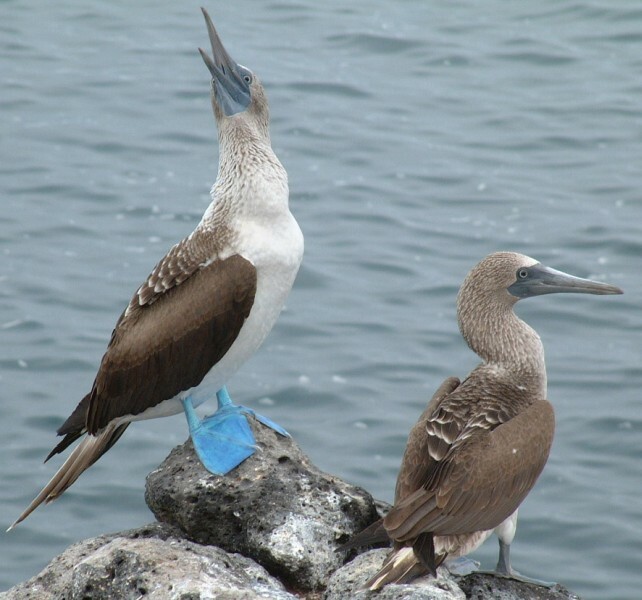 There are three species in the Galapagos: the red-footed, blue-footed and masked boobie. Of these, we have seen another subspecies of red-footed boobie by the thousands on the islands off Venezuela, but in the Galapagos the red footed ones are the least common. The elegant Masked Boobie is the largest of the Galapagos boobies. It's rare to see these birds plunge dive for their fish because they tend to feed far offshore. There are several breeding colonies on different islands, and the breeding season differs. Two eggs are laid but generally only one chick survives. We were lucky to see both mature and juvenile masked boobies flying around Ocelot during our passages both to and from the Galapagos. The spectacular bright blue eye ring is characteristic of the tiny Galapagos Dove which was once killed for its meat. Today it is protected but it has already lost its tame nature. Apparently the birds often used to perch on the heads and shoulders of the early buccaneers. 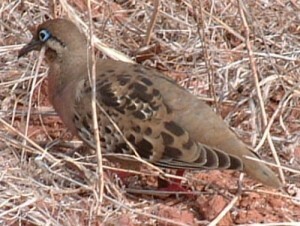 The doves eat fallen seeds, usually of the opuntia cactus. 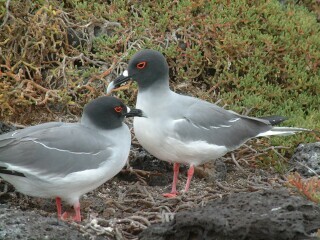 Red eye-rings are a distinctive characteristic of the Swallow-tailed Gulls, the world's only nocturnal seagull. We first saw these birds on passage from Ecuador to the Galapagos as they swooped and dove around our boat at night, hundreds of miles east of the islands. Their call is a harsh scream, but they also emit a very un-gull-like rattle, thought to be similar to echolocation to enable them to fly safely at night. The young are white (the only white juvenile gulls), probably to help the parents locate the young for feeding at night. There are 13 species of Darwin Finches in the Galapagos, and most are very difficult to tell apart. We often had to use behavior and location (and a process of elimination) to help distinguish one from another. To determine a Large from a Medium Ground finch, for example, it would help to have the two birds side-by-side. But that's not very likely (unless you have dead specimens, like Darwin did.) 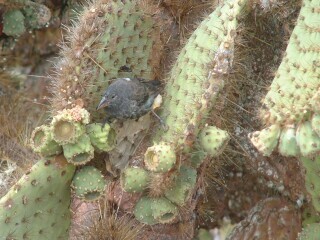 We believe this to be a Cactus Ground Finch, feeding on the fruits of the opuntia cactus. The Magnificent Frigate Bird is a long-time friend of ours from Venezuela. But rarely do we get to see one as close up as this, and so relaxed. These graceful flyers have a wingspan up to 1.25 meters (over 4 ft). 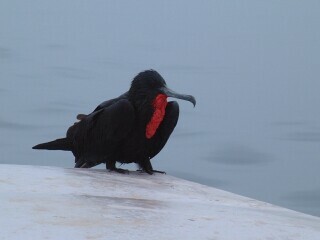 This male perched on the cabin roof of our tour boat with his red goular pouch deflated. When inflated it's like a giant red soccer ball beneath the bill. Since it was mating season we saw many of these brilliant displays. Present in the Galapagos is not only the Magnificent, but the Great Frigate Bird, identified by the green sheen on the back of the feathers, and the amount and placement of white on the adult female. 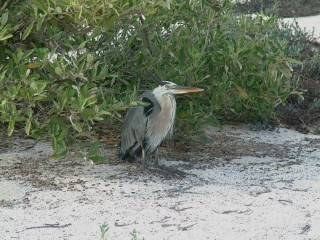 The Great Blue Heron is by far the largest of the Galapagos herons, standing about 1.4 meters (55 inches) high. This is the same species that is found in North and South America. 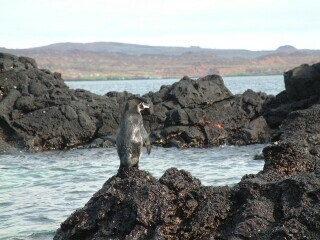 Although they feed mainly on fish, they have been seen eating small lizards, marine iguanas and sea turtle hatchlings. The Galapagos Mockingbird is one of the most commonly seen land birds in the arid lowlands of the main Galapagos islands. They are easily recognized by their thrush-like size, gray and brown streaked plumage, and long tail. More predatory than their South American relatives, they eat lava lizards, insects, centipedes, carrion, seabird eggs, and young finches. They also are pests around scientists (and tourists) who leave any food or liquids unguarded. 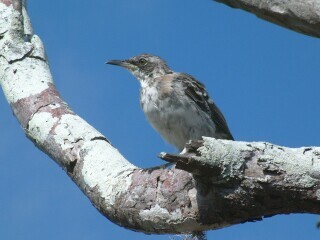 Although they are not mimics like other mockingbirds, their call is clear and varied.